Geoscientists are depending more and more on synthetic aperture radar's all-weather, day and night capability  using it to map digital topography, to study Earth as it moves and to detect and monitor floods, oil spills or storm damage as quickly as possible. Rosalind T. Helz et al. Mosaic images of entire continents can serve as benchmarks for monitoring global change. The days of collecting beach profile data solely in the field are gone. Now coastal geologists are looking to the skies, using a new radar tool to study changes to the shoreline over large areas. Commercial farms around the world are changing, and remote sensing is beginning to play a large role. A new suite of technologies promises to help farmers better manage their crops at the scale of individual fields. In April, President Bush authorized a national policy establishing guidance for federal use of commercial satellite data. Civilian agencies must now examine their needs. Managing public access and wilderness protection on federal lands is one of the most enduring policy-making challenges. In the 1960s, the Soviet Union was a vast expanse waiting to be explored. It was geologists who took the call, traveling to the farthest reaches of the country  inspiring a new generation of geological explorers. This shaded-relief and color-coded topographic image shows a portion of Matagorda Island, Texas, off the coast of the Gulf of Mexico. Elevation data were acquired by the University of Texas at Austin with an airborne laser system, called LIDAR (light detection and ranging). 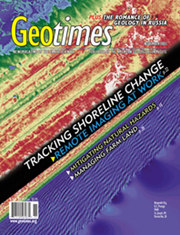 Coastal geologists are beginning to use this system to map historical shoreline change. 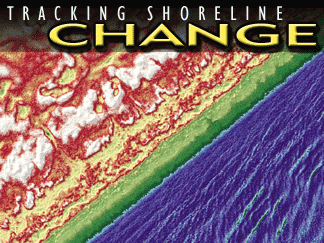 Read the story on tracking shoreline change. Image courtesy of James Gibeaut.